As I’ve mentioned MANY times Weekends = Pancakes. This particular recipes is extra amazing because it is a peanut butter lovers dream and I am a peanut butter lover! Hopefully you are too! Top with: Syrup, Cinnamon, Banana and Peanut Butter! Blend all the ingredients together and pour on a griddle or pan sprayed with non-stick spray. Cook on medium heat flipping halfway through. Top with syrup and banana! 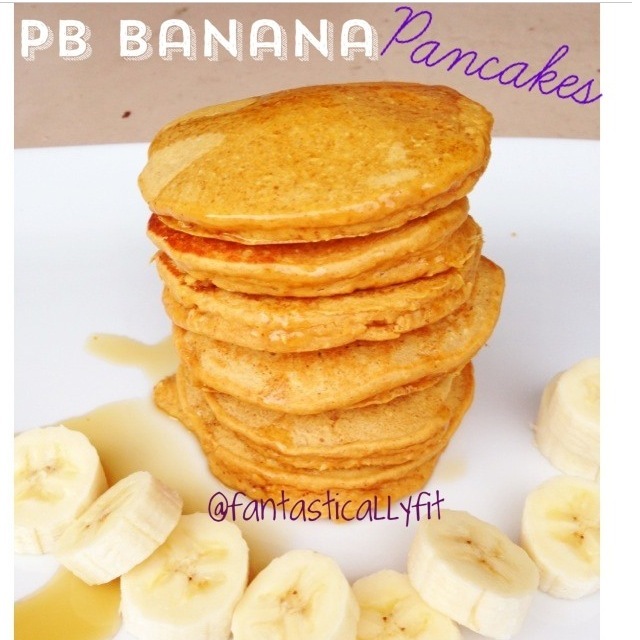 6 Responses to "Peanut Butter Banana Pancakes"
Where do you edit your pictures? I loooove the font! I use a bunch of different apps but mainly A Beautiful Mess. I personally do not eat it. It is full of chemicals. I just use pure maple syrup. These look AMAZING! I’m obviously a HUGE fan of pancakes and like any and all variations lol! I’m having a hard time finding peanut flour…where do you buy yours?